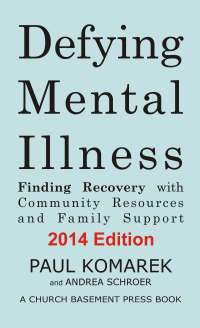 Andrea Schroer and I are pleased to announce the 2013 Edition of Defying Mental Illness: Finding Recovery with Community Resources and Family Support. This is a major update. We reorganized the material so it is even easier to read -- and added new material on eating disorders, family support, suicide prevention, anti-stigma programs, and violence prevention, plus we updated our sections on Social Security, Medicare and Medicaid. More importantly, we responded to reader suggestions and included new material that helps churches and community groups do outreach to people with mental illness. We have included a simple script that anyone can use to provide support and screen for trouble. It's just four questions. We think that simple scripts and some very basic training can accomplish for mental illness recovery what AA accomplished for sober recovery. Anyone can use our book to help a friend stay safe and engaged in a recovery process. Defying Mental Illness is the only book of its kind. It is a one-volume quick reference, plus a resource guide, plus a guidebook to recovery. It works as a basic textbook. Most importantly, Defying Mental Illness is truly strength-based, focused on recovery, and designed to keep families working together to support each other. The new edition is currently migrating through our distribution channels. It will be available on all e-book platforms and through Amazon, and distributed to libraries and institutions through Baker and Taylor. The distribution process should be complete within about two weeks. The following direct links work right now. Defying Mental Illness 2013 Edition on Amazon -- print edition. Defying Mental Illness 2013 edition - All ebook formats on Smashwords - includes Nook, Apple, Kobo, Sony, and PDF versions.